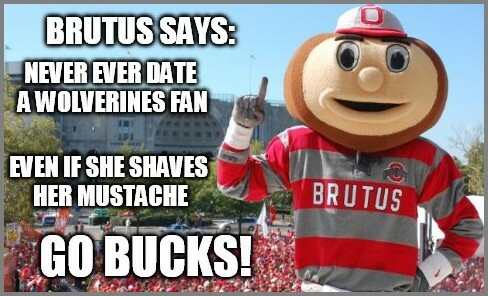 Sometimes when you search for Ohio State/Michigan rivalry pictures, you find crazy things like this. I am a firm believer that college athletes should be properly motivated and ready for any game they face, but there’s always an extra bit of juice for a rivalry game. There’s something special about these games. The way they evolved, the way they play out and the intensity that manifests itself between the lines. As an Ohio State fan it is ingrained in me that I hate Michigan. Really, I should be saying I hate TTUN (That Team Up North). Even saying the name of the school/state is sacrilege, especially on the week leading up to The Game. Heck, I think I may have enjoyed Michigan’s season-opening loss to Utah even more than some Utah fans did! But as an inquisitive kid, I wanted to know, why do Ohio State fans hate Michigan? So I did my research. One of my favorite books immediately became War As They Knew It. The book did a fantastic job explaining the origins of the rivalry, why Woody Hayes said he would rather push his car to the state line than spend money in Michigan and why those in maize and blue think it’s funny to call Ohio State ‘Ohio’. And of course a rivalry ramps up simply by the games you live through. I never got to experience Woody and Bo Schembechler going at each other in the 1970s, but I was there in 2006 watching the Game of the Century quite intently as undefeated No. 1 Ohio State downed undefeated No. 2 Michigan in a shootout, 42-39. It was the only time the two rivals have met as the top two ranked teams in the country and just the first time since 1973 that both teams entered the game undefeated. But while counting down to The Game every year is exhilarating and I’m glad to take all the ‘M’s out of my vocabulary in the week leading up, it’s different when you are a part of the team that is part of the rivalry, or even if you go to the school. I am a proud graduate of Hofstra University, which for many years meant that I hated George Mason basketball. I hated Tony Skinn and his low-blow to one of our guys. I hated that Mason made the NCAA Tournament in 2006 after losing TWICE in a week to Hofstra. But I wasn’t there for that. I did not get to the school until 2008 and at that point things had not mellowed, but there was no incidents or de-facto playoff games in my time. Jim Larranaga left George Mason for Miami, George Mason left the Colonial Athletic Association for the Atlantic 10 and the rivalry as a whole fizzled out. What I consider to be my first super intense rivalry game would be playing against Vassar my first season working at Bard. The two schools are about 30 minutes apart, but so different. 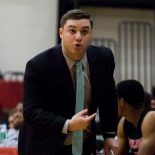 Vassar had consistently been the better team (currently ahead 27 to 6 in the men’s basketball all-time series), but Bard has battled back recently (5-3 since joining the Liberty League four seasons ago). My former boss at and the Raptor’s all-time leading scorer Adam Turner has a deep-seated passion for beating the Brewers. His time at Bard as a player did not feature many highlights against the local rival and included a broken orbital bone, which cost him half of a season. Those games were the most fun though. The tension between the two teams was palpable as soon as you stepped inside the gym. There was a certain atmosphere that is hard to put into words exactly, but best exemplified by the cautious stares of each team at each other as they sit during the women’s games. Coach Turner did not want to lose and neither did Vassar coach BJ Dunne (who has since become a friend, rather than a rival). Even getting swept my first year, losses were only by seven and four points, respectively. My second year though, we evened it out, sweeping Vassar: winning first by seven points in Poughkeepsie and then hammering the rival by 28 points at home on senior night. Now that I am at Wesleyan I am excited to see which rivalries are the most intense and which teams are the most reviled. Is it Trinity or Conn College, each just 20 minutes down the road? Or is it Amherst or Williams, the only conference teams we play twice each year thanks to being in the Little 3? Could it be Bates, the team Coach Reilly used to coach? Based on how talented the NESCAC is top to bottom, it seems like every game has a ridiculous level of intensity, but there’s always another level available to reach for a rivalry game. I can’t wait to see which game is going to be the most intense. This entry was posted on September 7, 2015 by Coach Sass in College Basketball, Miscellaneous.